The Bosphorus strait in Turkey (also known as the Istanbul Strait) marks the traditional boundary between Asia and Europe also connects The Black Sea with the Sea of Marmara. It is one of the narrowest international shipping straits in the world and is a major route of trade between Europe, Asia, and Russia. However the Bosphorus is not just in use as a commercial waterway, it is also a popular spot for pleasure cruises for visitors to Istanbul. As well as being an area of natural beauty, the area has incredible historical significance and played an important part in the histories of the Greek, Roman, Ottoman, Persian and Byzantine Empires. 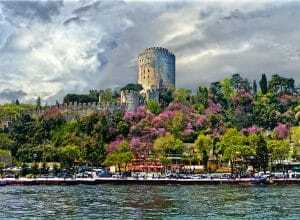 For all these reasons and more, holidaymakers flock to Bosphorus in their thousands. to be able to afford it! Whilst the initial prices of all of the Su Yachts private yacht cruises in Bosphorus include the cost of fuel, yacht crew hire and any soft drinks (including tea and coffee) which you wish to consume on the journey, some other extras are available onboard at a small price. Alcoholic drinks and meals (including delicious, locally caught fish dishes) which you may wish to purchase on the boat are available from the private bar area at a low price. All extras which are purchased once on the boat can be paid for using either cash or credit card. Although the minimum length of all of our cruises is 2 hours, when the opportunity is available, many of our clients even choose to extend the length of their cruise, in order to spend even longer enjoying the opulent private yacht environment. On our longer trips, guests are given the chance to drop anchor and swim in some of the nicest and safest spots off of the coast of Turkey. There are even showers on board so that you can wash yourself down after a relaxing swim. If younger guests are not entertained by the magic of Bosphorus, there is free wireless on board, as well as a 32 inch LCD TV and sound system which are available for guests to use at any time during the journey. If you want to enjoy private yacht cruises in Bosphorus, contact Su Yachts. 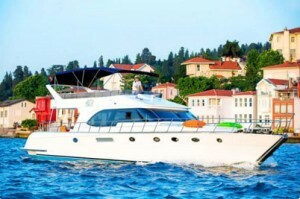 We are the experts in private yacht cruises in Bosphorus. We have different yacht options at different prices. You can check our pricing page for the yacht photos and the prices. We are a licensed yacht charter company with our own yacht fleet and operation. We provide yacht rental services to travel agencies and hotels too. However, if you book directly from us, you will get much better deals and also, communicating directly with us will reduce communication errors and we will understand your expectations better. Our references can help you better understand our service quality. We are working with Turkish Airlines for Bosphorus Experience program to host Business Class passengers. (Turkish Airlines Bosphorus Experience). We host presidents of countries, worlds biggest companies CEOs and celebrities.